After building the number one country-music agency in the world, Halsey eventually sold it to found the Jim Halsey Institute, which focuses on helping others pursue their dreams in the music industry. In his new book released nationwide this month, titled �Starmaker,� he continues that mission by sharing the secrets he learned while shepherding the careers of entertainment giants. Published by Tate Publishing and Enterprises, the book digs deep into the fundamentals: how to develop an act, how to get an agent, how to use the press to build your audience, how to play the biggest and best forums. His incisive advice will help readers find their place on the team�the position that provides the most successful and most fulfilling career. Whether you dream of seeing your name in lights or prefer a powerful position behind the scenes, Halsey can tell you how to achieve your dream. The book is available through bookstores nationwide, from the publisher at www.tatepublishing.com/bookstore, or by visiting barnesandnoble.com or amazon.com. Throughout his career, Halsey has worked with The Oak Ridge Boys, Roy Clark, Hank Thompson, Reba McEntire, Wanda Jackson, Tammy Wynette, Rick Nelson, Roy Orbison, Dwight Yoakam, Clint Black, the Judds, Merle Haggard, Waylon Jennings, Lee Greenwood, and a host of others. Since 1990, The Jim Halsey Institute has been helping artists� dreams come true everyday. Halsey continues his active management of the supergroup, The Oak Ridge Boys. When he is not traveling, teaching, or writing, he lives near Tulsa, Oklahoma, with his wife, Minisa. More people than ever are choosing to reduce their consumption of meat, instead, eating a diet rich in vegetables, legumes, whole grains, and fruit. A varied vegetarian diet can lead to a healthier, more vibrant life and is more environmentally friendly. 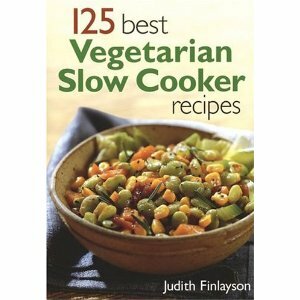 Best-selling cookbook author, Judith Finlayson, proves that vegetables are both healthy and delicious and has created a vast array of wholesome, satisfying, and meatless recipes for today�s favorite kitchen appliance: the slow cooker. The result is The Vegetarian Slow Cooker (Robert Rose; February 2010; softcover/$24.95; ISBN: 978-0-7788-0239-6) with over 200 new recipes that will appeal to anyone looking to eat well without spending hours hovering over a hot stove. As with any cookbook by Judith Finlayson, the results are appetizing and innovative. Adding a slow cooker to the mix means that home cooks can be away from the kitchen all day and return to a hot, comforting meal. Featuring not only traditional recipes and updated classics, The Vegetarian Slow Cooker also highlights exotic dishes that reflect the expanding horizons of cooking in our global world. From great family food to more sophisticated dishes perfect for entertaining, Judith has even included more than 130 �vegan friendly� recipes, easily identified for quick access. Home cooks have come to trust Judith Finlayson with their dietary needs. Her previous vegetarian slow cooker cookbook, 125 Best Vegetarian Slow Cooker Recipes, sold over 60,000 copies, and combined, her slow cooker books have sold more than 750,000 copies worldwide. Judith strongly believes that eating is one of life�s greatest pleasures and has spent significant parts of her adult life searching out memorable food experiences. She is a well-respected food writer, journalist, and best-selling author. Using her recipes, thousands of people have discovered not only how delicious and convenient food prepared in the slow cooker can be, but also how this handy appliance can be used to create an extraordinary range of dishes not typically associated with a slow cooker. She is also the author of 125 Best Rotisserie Oven Recipes, The Convenience Cook, and The Complete Whole Grains Cookbook. In addition to cookbooks, Judith is the author of four other books including The New Woman�s Diary: A Journal for Women in Search of Themselves. She has a long history of community involvement and has served on numerous committees and boards, focusing on the arts and social issues. Judith lives in Toronto with her husband and daughter. If you�re looking for something delightfully different but delicious, look no further. This simple soup is an exquisite combination of textures and flavors. Serve it as a light main course or in small quantities as a prelude to dinner. In a skillet, heat oil over medium heat. Add onion and leeks and cook, stirring, until softened, about 4 minutes. Add garlic, salt, peppercorns, cinnamon stick and flour and cook, stirring, for 1 minute. Add barley and toss to coat. Add 2 cups (500 mL) of the broth and bring to a boil. Boil for 2 minutes. Transfer to slow cooker stoneware. Stir in remaining 4 cups (1 L) of broth. Cover and cook on Low for 6 to 8 hours or on High for 3 to 4 hours, until barley is tender. Discard cinnamon stick. Add paprika solution to slow cooker along with chile peppers, yogurt and mint. Cover and cook on Low for 15 minutes to meld flavors. After adding the yogurt, cooking on Low ensures that the soup doesn�t boil, in which case the yogurt would curdle. Use the type of barley you prefer � pearled, pot or whole. Whole (also known as hulled) barley is the most nutritious form of the grain. Barley, like all whole grains, really soaks up liquid. If you�ve refrigerated this soup and are reheating it, you�ll need to add water to ensure an appropriate consistency. If you are halving this recipe, be sure to use a small (approx. 2 quart) slow cooker. Complete Step 1. Cover and refrigerate for up to 2 days. When you�re ready to cook, complete the recipe. Because the barley soaks up liquid on sitting, add an extra 1⁄2 cup (125 mL) of broth or water before cooking.